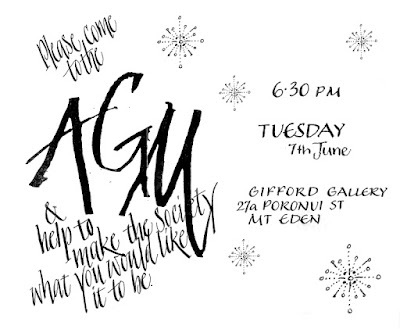 The AGM is happening next Tuesday 7th June. Please come along and help make the society what you would like it to be. We would love to see you all at the New Zealand Calligraphers AGM on Tuesday 7th June. and bring it along for a show and tell. There is also a book plate competition and we will be judging the winners at the AGM. If you have any books out from the NZ Calligraphers Library please bring them along to the AGM.